Longtime Tesla short firm Citron Research has totally flipped on Tesla [TSLA]. It has gotten straight from its multi-year position shorting the stock all the way on over to a comfortable long position in the stock, according to a report issued by the firm today. 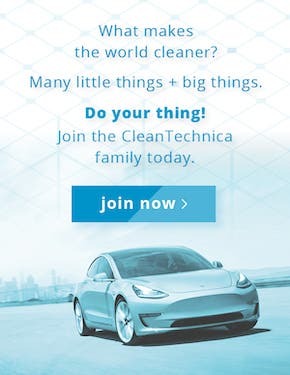 The longtime shorter of Tesla’s stock issued a 9 page report to justify its change of heart, citing numerous charts from CleanTechnica in support of the change — well, four out of the 18 “nasty charts” we published on Sunday. The firm specifically cited the success of the company in producing and delivering the Tesla Model 3, noting that many of the warning signs it had flagged in support of its short position proved to be insignificant. Tesla stock ended up nearly 13% today, seemingly based on the news of Citron’s change of heart more then anything else. The stock also kept climbing after hours. Fast forward to today and Citron Research has seen the light … or at least our charts. In support of flipping to a long position in the stock, Citron picked up its Tesla-branded pom-poms and cited several of the charts created by Zachary Shahan to show how much of a beating the Tesla Model 3 and the Tesla Model S are delivering to the competition. Now fully embracing its role as a Tesla cheerleader, Citron said that the results from Tesla’s third quarter production and delivery ramp make it clear that Tesla is the only automaker that’s capable of building and selling electric cars (for a profit). They noted, “It looks like it is the competition that is taking the Ambien.” For those that don’t follow everything Elon Musk does, that’s a reference to his comments about taking Ambien here and there to help turn his brain off, as well as a reference to other automakers being a sleep, we presume. Citron Research didn’t just pull out of its short position — it went whole hog into to a long position in Tesla! Continuing its justification for its change of heart (or at least investment policy), it highlighted that Tesla delivered 83,500 cars to customers last quarter and that, as part of that tale, the Tesla Model 3 trounced the competition, besting Porsche and Mercedes in quarterly sales and absolutely dominating the mid-sized luxury car class (as well as the small luxury car class). It didn’t just do okay — it absolutely dwarfed the competition. Citron cites this performance, as well as Tesla’s ability to not just pull sales from the competition in the mid-sized luxury class. He noted that the model pulled its top conquest sales from the likes of the $23,475 Toyota Prius, the $23,570 Honda Accord, and the $18,940 Honda Civic. Hardly competitors in its class and more proof that the Tesla Model 3 demonstrates not only demand within its class, but as an affordable electric vehicle capable of generating significant demand. As Citron puts it, “Like a magic trick, while everyone is focused on Elon smoking weed, he is quietly smoking the whole automotive industry.” I think Elon is just under immense pressure and has no problem letting off some steam. The difference is that while other CEOs are under similar pressure and even make use of Ambien or smoke a joint once in awhile (which is perfectly legal in California), they do it behind closed doors and Elon does it on a podcast. Plus, it appeared that Elon doesn’t actually smoke weed and simply did so for show or out of politeness for Joe Rogan while in his studio. 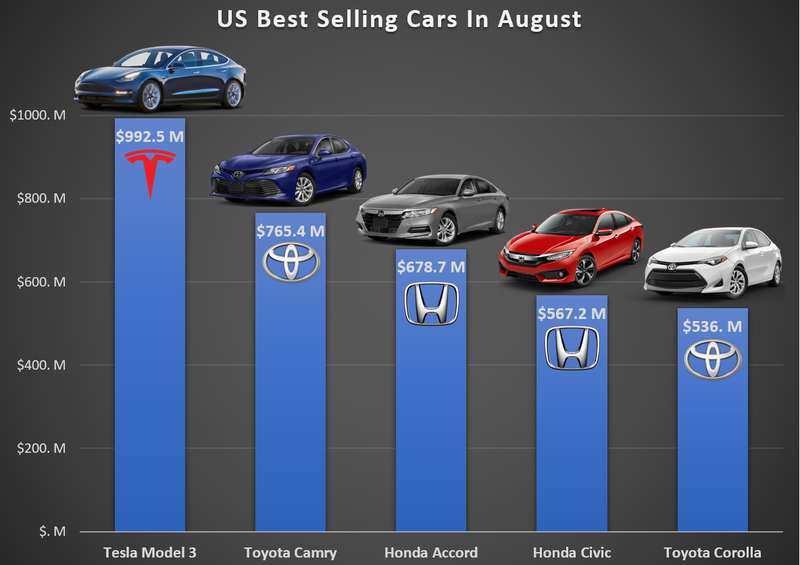 Tesla’s blockbuster sales in Q3 made the Model 3 the top selling car in terms of revenue, bringing in $992 million in revenue in August alone. Let me play that back for you. Tesla brought in almost one billion dollars in a single month from a single car. It seems to have bested stalwarts of the top selling automotive list by more than $200 million to claim its place at the top of the chart. And sales in September were significantly higher (report coming). 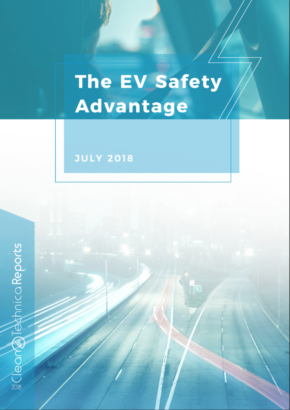 Citron believes that the strong results it saw from third quarter production and deliveries demonstrate that Tesla has turned the corner from fledgling startup into the ranks of the established automotive companies. That changes the question from “are they going to make it?” to “how much can this thing really grow?” and Citron is excited about the possibilities. After betting against the steep odds of becoming an automotive giant, the company now considers that Tesla has made it and it’s better to now become a Tesla long while waiting for others to catch on to the unexpected reality. Even if Tesla did not hit its profitability targets in the third quarter (we’ll find out on the earnings call tomorrow afternoon), Citron is bullish on the stock based on its fundamentals. Tesla is building out its wholly owned factory in Shanghai, from which it can expand sales into new Asian markets. This allows the company to avoid paying Trump Tariffs on its sales in China and beyond, not to mention cutting out the non-value-add transportation expenses required to ship containers of cars from California to China. Tesla has room to expand in Europe as it looks to the launch of the Model 3 in the EU. The launch of the Model 3 in Europe will likely come in close proximity to the announcement of the location of Tesla’s European Gigafactory. The new Gigafactory is expected to be located near the French–German border, leaving the two countries to curry favor with Tesla as it finalizes the location over the next few months. Tesla Semi, Model Y, a pickup truck, Autopilot, and even the possibility of the Chinese trade war dying off are all out there as the icing on top of the solid fundamentals Citron Research sees at Tesla. Citron builds on its case for Tesla by running the numbers for profitability. Are Tesla’s vehicles profitable? 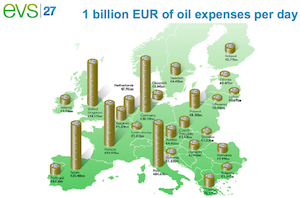 And if so, what does that look like in terms of profitability? The short answer is yes, and it goes back to the teardown of a Model 3 that Munro and Associates performed several months back. Sandy Munro and his team found that the electronics in the car were “like a symphony of engineering,” and that the battery pack was the best they had ever seen. Most relevant to Citron, Munro estimated that the Model 3 was capable of a 30% margin, reinforcing Musk’s claims that the Model 3 should be able to achieve margins in the high 20% range. “The Model 3 is profitable. I didn’t think it was gonna happen this way, but the Model 3 is profitable. Over 30%. 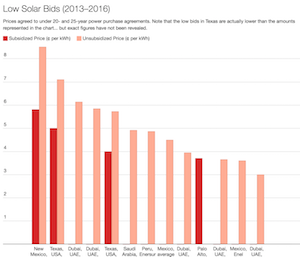 No electric car is getting 30% net, nobody,” Munro said. Scaling that up, Citron believes that even at the worst case, based on what it believes Tesla can do with its current production facilities, 500,000 cars at a conservative 20% margin equates to a stock price of $599. that’s leaps and bounds beyond the $260 per share the stock was at when the analysis came out and it is the reason it has leapt up 12.7% to the $294.14 per share it currently sits at. Things only get more interesting from there, depending on the volumes and margins Tesla is able to sustain as it scales up Model 3 production across global markets, as it brings Model Y online in 2020, and as it gets to commercial availability with the lengthy list of ambitious products it has lined up thereafter. The full report from Citron Research is well worth the read for anyone looking to get the cliff notes version of the current state of Tesla. The only question outstanding is, how many other short sellers are having similar “coming to Jesus” moments today as Tesla prepares for yet another “most important earnings call in its history” tomorrow? My personal guess is that they are not alone and we’ll hear similar stories coming out as the shorts either cash in or prepare to be escorted out tomorrow by Musk and team as they announce what many experts are saying will be their first profitable quarter in a long string of profitable quarters from here on out. “Citron’s u-turn just proves that shorting is one of the biggest Ponzi scheme known to man kind. Citron and other smart shorters kept pumping their narrative until TSLA was rock bottom, in process attracting a huge following of dumber shorts who piled in. And in a classic move, went long leaving dumber shorts holding the bag. How much are you down today, shorts? Enjoying the Ponzi Scheme your leader has created?